Spring in New England means that melting ice is on everyone’s mind, with freezing rain, muddy walkways and a pervasive grayness in the air characterizing our day-to-day existence. At Dartmouth, breaking the ice is not just a mindset but a lifestyle, as we are pushed nearly every day to meet new people and build strong relationships. 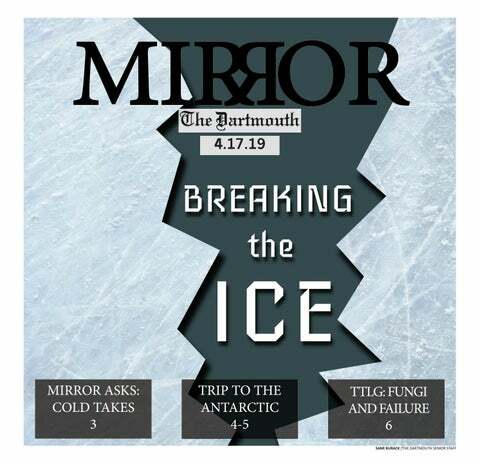 While being extroverted is often seen as a unifying commonality at our school, this week the Mirror acknowledges and celebrates the less publicized ways that students and professors break the ice. We explore high school orientation programs that bring low-income and minority students to campus, proﬁle a Dartmouth-led trip to Antarctica, examine the ways female campus organizations break the glass ceiling and acknowledge the inevitability of failure. We ﬁnd that breaking the ice, while challenging, can make waves in unexpected and powerful ways. And perhaps most inspiring of all is the fearlessness of the individuals who do the breaking. As we transition from winter to spring, we have to remember that sunshine, far away as it may seem, is just around the corner, and with sunshine comes the warmth that begins to break the ice. Sending you all the warmth and positive energy as we tackle week four. participated in FYSEP this past meaningful. fall, said the program was a defining “I think FYSEP is especially part of his college transition period helpful in assuring incoming because it helped him connect freshmen that they have a place with other Dartmouth students here, that they’re important here who shared his same concerns and and that they have people who feel struggles. the same way that they do and who “I personally think it’s incredibly have been successful in the same important to make sure first- shoes that they’re in right now,” generation students feel less isolated Alvarado said. 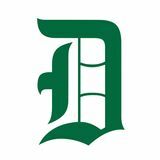 on campus so that they don’t feel like Once on campus, the fight for coming to a place like Dartmouth inclusivity and community doesn’t was a mistake,” Hutto said. “So stop. The Coalition for Immigration many first-generation students Reform and Equality at Dartmouth come to college, feel like it was a is a group of students with the mistake and then drop out because mission of “advanc[ing] the rights they didn’t have the resources that of undocumented students at most kids just have built in within Dartmouth College and in the United their families.” States through raising awareness Similarly, Diana Alvarado ’22 said and educating the Dartmouth she found FYSEP community on to be quite useful immigration in helping her “I remember thinking: issues and the prepare for her This is the program undocumented time at Dartmouth ex p e r i e n c e, ” both academically that will help me according to a n d s o c i a l l y, become the best its website. especially as a J u a n version of myself.” first-generation, Quinonez first-in-family Zepeda ’22, college student. who is a part -DIANA ALVARADO ’22 “It took a lot of CoFIRED, of weighing to discovered decide whether the prog ram or not I wanted through his to do FYSEP, but ultimately I FYSEP mentor Jesus Franco ’20. realized that no matter how much He said CoFIRED has given him a my family loved me, there were meaningful opportunity to finally things my parents just ultimately fight for issues that he has always had couldn’t teach me,” Alvarado said. interest in but never got a chance “I remember thinking: ‘This is the to address, such as immigration program that will help me become advocacy and justice. the best version of myself that I “Before coming to Dartmouth, could be in college.’” I used to be very scared of how to Even after the initial transition approach immigration issues and period into his fall term, Hutto said how to fight for undocumented that he felt that FYSEP played a people,” Zepeda said. “Being a part role throughout his freshman year of CoFIRED has truly embedded simply because it gave him a sense in me this drive and dedication to of “perpetual community” on which fight for people all around the world he could always rely. Furthermore, who might be struggling with these Alvarado said that FYSEP gave her issues.” a sense of tight-knit community Whether it be before we get to and knowledge that other people Dartmouth, right before we start had gone through the experience our time here or after we’ve been on she faced. Having that community, this campus, we continue to break especially in a new environment the ice with the aid of the support such as Dartmouth, was especially systems that we cultivate. because I started picturing each person next to their vegetable, just wondering if they looked alike. MD: Two truths and one lie. NZ: Honestly, I hate icebreakers because I always panic when it’s my time to share. During O-Week, I accidentally said that my pronouns were “he, him, his.” CC: When two people go into the middle of the circle and someone on the outside gives an adjective, another gives a vegetable and the two people act it out. One is declared the winner. JK: The “Shoe Game” is an excellent icebreaker. Everyone puts one shoe in the middle and grabs a diﬀerent shoe before striking up a conversation with that shoe’s owner. Describe your ideal ice cream order. JN: Coﬀee ice cream, coﬀee ﬂavored anything! DK: Oreo and Moose Tracks. PC: Chocolate cookies and cream on a rainbow sprinkle waﬄe cone. SA: In the summer, black raspberry with chocolate sprinkles. In the winter –– because yes I still eat ice cream in the winter –– probably Oreo or something coﬀee-related. MD: Moose Tracks ice cream topped with cookie dough. NZ: Mint chocolate chip with Butterﬁnger crumbles in a cake cone. CC: Coﬀee ice cream with chocolate chunks in a sugar cone. JK: You have to start with the heaviest ice cream on the bottom and work your way up. So I’ll put my butterscotch ice cream on the bottom, then strawberry above that, then raspberry sorbet, then rainbow sherbet and ﬁnally lemon sorbet. I’ll take whipped cream too, but I’m eating that ﬁrst before touching the ice cream. What are you most excited for this spring term? totally go.’” Though there are some concerns about the environmental impact of this increasing tourism, Virginia believes that if it’s done responsibly, increased tourism can actually help Antarctica by increasing awareness of issues around climate change. If you’re not a ’19, don’t have $10,000-$17,000 or are reading this after spots have sold out but are still envious of the alumni embarking on the Antarctic expedition, good news: Virginia said they’re hoping to bring along two to three Dartmouth undergraduate students. zone only to get smacked down to the floor with a baseball bat. Another moment that stands out to me--perhaps my first true sob-heaving failure--is when I was in SART 25, “Painting I” during my sophomore fall. I care deeply about creating art and pushing my creative boundaries, so I placed a lot of importance on the work I made in the class. I spent dozens of hours on the first painting of my final series and created a piece I loved and was incredibly proud of. During our class critique that day, I proudly hung up and explained the labor of love that was my finished product. My professor stared quizzically at it for a few seconds, paused and matterof-factly told me, “I don’t like it.” She then proceeded to explain why it was a fairly simple painting with little color creativity. The second I left class, one might say I lost my f—ing sh—. How could I put so much effort and time into something just to have someone else reject it? To have them invalidate all of my effort and skill in three minutes? Why was I not perfect? This was the general mindset with which I entered my senior thesis: Aim for perfection. Even after that first Friday breakdown, I got shot down again and again by the fickle reality of doing science. Repeated and massive failure is literally inherent to the scientific process. One particular winter evening, an experiment on which I had spent dozens of hours failed before my eyes. Once again, I sat hyperventilating and ugly-crying on the floor of the LSC bathroom at 11 p.m. I was no longer panicking at the fear of failure like I had been in the fall. I was panicking because this time, I had actually failed. I could no longer avoid it. No matter how many hours I put in, no matter how much I cared about and loved science, no matter how much I tried, I was not perfect. I firmly believe that these knowing that I can produce moments have made me a better something funny and that every person. Failure not only humbles other person in the group always you but makes you realize what has my back. I am still incredibly you truly care about and pushes proud of that painting, and my you to pursue artwork has that. The past grown and four years at “The past four years at evolved since D a r t m o u t h Dartmouth have made my sophomore have made fall into a body me realize me realize that you of work that that you experience your biggest encapsulates e x p e r i e n c e failures in what you care my artistic your biggest voice. Although failures in about the most.” I ultimately what you care dropped a whole about the portion of my most. Those thesis, I’m still failures hurt you so much because producing a project that I’m really you care. I’m incredibly grateful excited about and interested in. that Dartmouth has pushed me I’m not going to pretend that out of my comfort zone in many I’ve now totally accepted myself ways, and by pushing me out of and overcome my failures. I still my comfort zone, has allowed me struggle every day to accept to fail. who I am. But my failures at I’ve grown greatly out of these Dartmouth have helped me grow failures. Flopping in Dog Day in ways I wouldn’t have if I hadn’t shows taught me how to improve challenged myself. So go ahead, and work better with the other take your time at Dartmouth to members of the group. My improv bomb a show, screw up a painting, skills have grown exponentially cry on the bathroom floor. You since those failures, and I am don’t have to be perfect. I’m not able to confidently walk on stage either. students to talk about internships, me that wants to do finance,” the recruiting process and Kyerewaa said. navigating the economics major. Female organizations on McGrail shared how difficult it is Dartmouth’s campus are ingrained to feel comfortable as a woman in in the culture. They send out finance. blitzes to the campus events listserv, “ Pa r t i c i p a t i o n they hold weekly is mostly by men. and their “It’s really helpful meetings So it’s really members are our helpful to have to have this space friends. We forget, this space where where we can sometimes, how we can practice much progress stock pitches and practice stock they make toward learn finance. Less pitches and learn breaking the glass stressful,” she said. ceiling, first on finance.” Kyerewaa added our campus, yes, that the group but later on in reinforces self- -CAITLIN MCGRAIL the wider world confidence. where these women “Just being there ’20 proceed to enact and seeing a huge change. Perhaps group of women organizations together really passionate about like this will continue to develop finance is also really fulfilling and at Dartmouth, and with this empowering, because you know institutional change, perhaps that all along it’s not just only cultural change will follow.